VATICAN Pope: "a faith that does not lead to witness, is not faith. It is words, nothing more than words”. 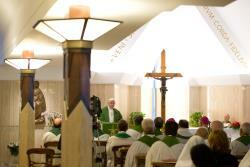 Pope: "a faith that does not lead to witness, is not faith. It is words, nothing more than words”. "Even demons. Demons know what is said in the Creed very well and they know that it is the Truth". "Do you believe in one God? You do well! But the demons do too and they tremble". The difference is that the demons "have no faith" because "faith is not having knowledge" but rather "receiving the message of God" brought by Christ. Vatican City ( AsiaNews) - "A faith that does not involve you , that does not lead you to the witness, is not faith. It is nothing more than words". 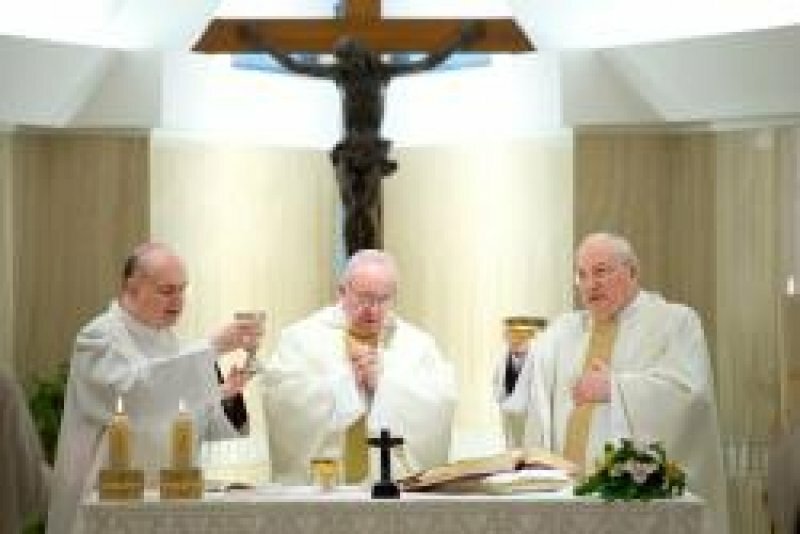 This was Pope Francis' message this morning during Mass celebrated at Casa Santa Marta, to affirm that the world is full of a lot of Christians who often recite the words of the Creed but rarely put them into practice. Vatican Radio reports that the Pope was commenting on the passage of the Letter of St. James where it says that "for just as a body without a spirit is dead, so also faith without works is dead". "We, too, - he continued - often get this wrong: 'But I have a lot of faith', we hear. 'I believe everything, everything ... '. Perhaps this person who says that has a lukewarm, weak life. His faith is a theory, but is not alive in his life. The Apostle James, when he speaks of faith, he speaks about doctrine, what is the content of the faith. You can learn all the commandments, all the prophecies, all the truths of faith, but if this does is not put into practice, if it is without works, it is useless. Theoretically, we can say the Creed, even without faith, and there are many people who do so. Even demons. Demons know well what is said in the Creed and know that it is the Truth". "Do you believe in one God? You do well! But the demons do too and they tremble". The difference is that the demons "have no faith" because "faith is not having knowledge" but rather "receiving the message of God" brought by Christ. The Pope pointed out that in the Gospel, there are two telltale signs of those who "know what it is to be believed, but do not have faith". The first sign is "casuistry", represented by those who asked Jesus if it was lawful to pay taxes or which of the seven brothers should marry their brother's widow. The second sign is "ideology". "Christians who think of faith, but as a system of ideas, ideologues: even in the time of Jesus, there were people like this. The Apostle John tells them that they are the antichrist, the ideologues of faith, whatever sign they may be. A that time there were the Gnostics, but there many ... And so, those who fall into casuistry or those that fall into the trap of ideologies are Christians who know the doctrine, but without faith, like demons. Except that those tremble these no: they live peacefully". On the contrary, in the Gospel there are also examples of "people who do not know the doctrine, but have so much faith". Like the Canaanite woman, who through her faith earns healing for her daughter, a victim of possession, and the Samaritan woman who opens her heart because "she did not meet with abstract truths" but "Jesus Christ". And again, the blind man healed by Jesus and who is questioned by the Pharisees and teachers of the law until he kneels in his simplicity and adores he who has healed him. The Pope concluded by pointing to these three people who show how faith and witness are inseparable. "Faith is an encounter with Jesus Christ, with God, and there is born and it leads you to the witness. This is what the Apostle means, a faith without works, a faith that does not involve you, that does not lead to witness, it is not faith. It is nothing more than words, just words". Pope: God's mercy is "a great light of love", it is "the way that God forgives "
Pope: "An absurdity to love Christ without the Church, to feel Christ but not the Church"